The Hearts for Hearts dolls haven’t had any new clothes in a while. So first up was Consuelo. I already had Consuelo a nice rose-colored t-shirt and wanted something to go with it. In the end I decided on Dollhouse Design’s Fiesta Folklorico pattern. 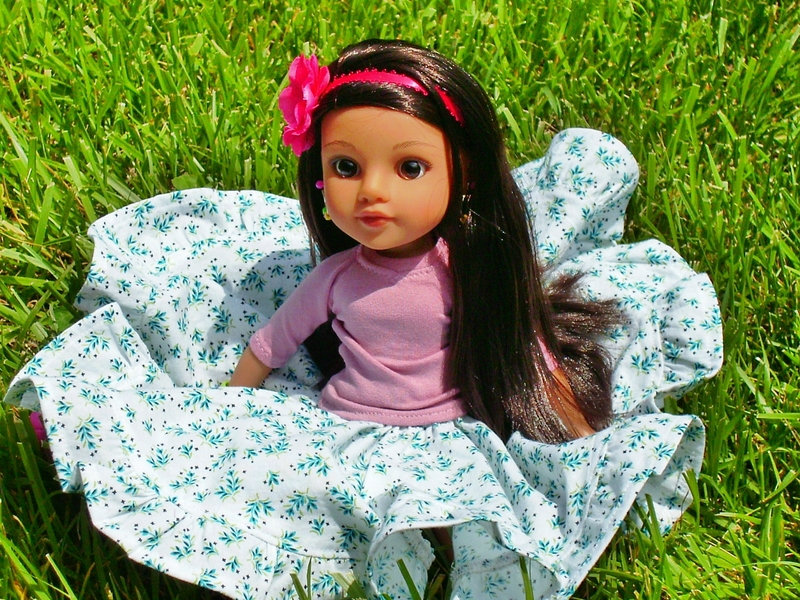 It gives options for two dress styles, a peasant style blouse and two skirt options. I decided to go with the long skirt option with ruffle at the bottom. Next step was finding fabric for Consuelo’s skirt and out of all the fabric at home nothing seemed to work well. Friday after paying my mortgage and getting a library book, I went fabric shopping for Consuelo’s skirt. I picked her out a quilting cotton that has a blue schemed floral pattern on it. It should work well with her pink shoes and rose top. This is the first Dollhouse Designs pattern I have used. The PDF was sixty pages. The instructions were well written and had great pictures. I didn’t use the instructions much. Everything seemed pretty intuitive. The skirt went together very easily. The most difficult part was gathering the bottom ruffle to fit. My ruffle was longer than suggested. I probably had a 89 inch ruffle but I wasn’t going to over think where to trim it for an 86 inch ruffle. The biggest change I made was switching the skirt from Velcro enclosure to an elastic enclosure. 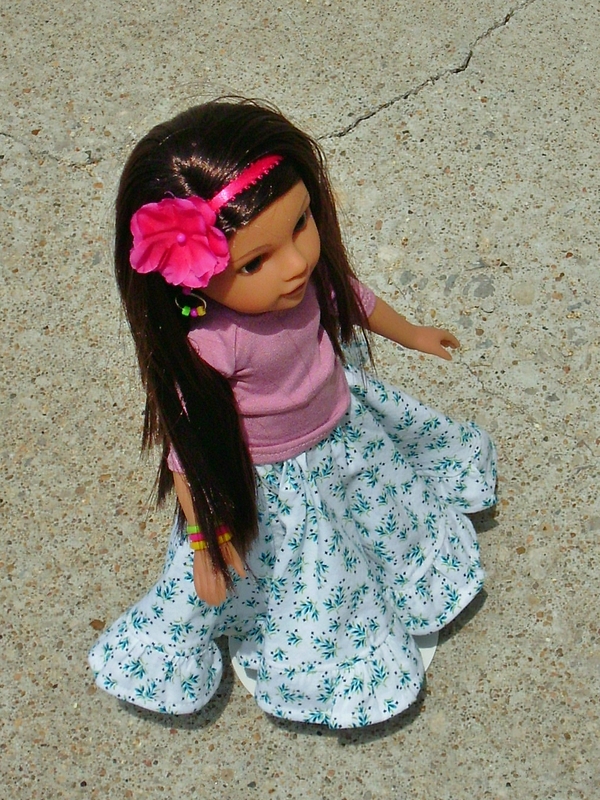 As Consuelo is a 14 inch doll, she has a waist that is almost a quarter of an inch smaller than the Wellie Wishers. I did baste in the back for a smaller waistline but really thought it was too much of an overlap. So instead, I cut a 6.5 inch piece of half- inch elastic and threaded it through the waist band and then sewed the back seam at 3/8 inch. 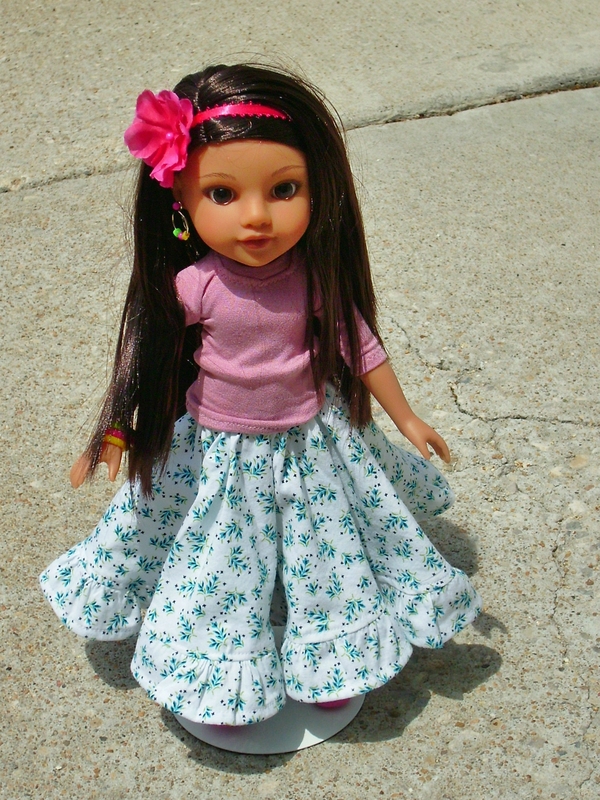 The skirt was a little tight sliding over Consuelo’s hips but otherwise, it fits her perfectly.